While out on research trips, we’ve seen white sharks breach and we’ve received multiple reports of breaching white sharks this year from fishermen and boaters. While encounters like this one are rare, this video shows that they’re certainly possible. White sharks are wild and unpredictable animals. 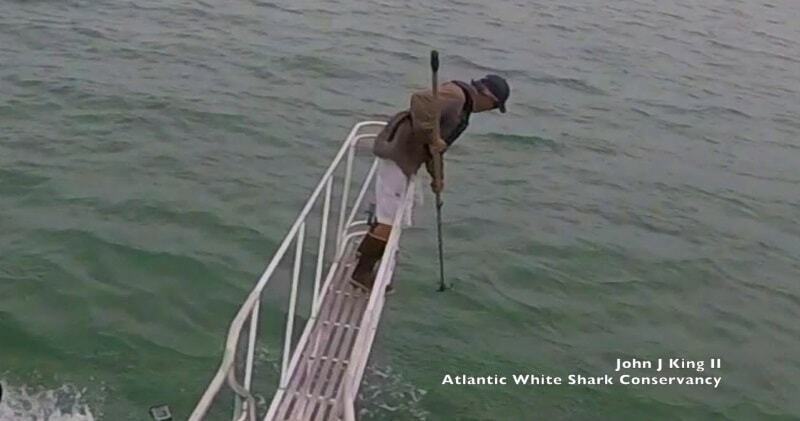 He was attempting to capture underwater footage using a GoPro mounted to a painter’s pole. As he was recording, a great white breached directly below him. This is a good reminder of the importance of not becoming complacent and always staying vigilant when in or on the water.